New Oriental Education & Tech Group Inc. (NYSE:EDU) shares haven’t seen a lot of action during the third quarter. Overall, hedge fund sentiment was unchanged. The stock was in 25 hedge funds’ portfolios at the end of December. The level and the change in hedge fund popularity aren’t the only variables you need to analyze to decipher hedge funds’ perspectives. A stock may witness a boost in popularity but it may still be less popular than similarly priced stocks. That’s why at the end of this article we will examine companies such as Wheaton Precious Metals Corp. (NYSE:WPM), Fidelity National Financial Inc (NYSE:FNF), and Cenovus Energy Inc (NYSE:CVE) to gather more data points. At the moment there are dozens of indicators stock market investors put to use to grade their stock investments. Two of the less known indicators are hedge fund and insider trading interest. Our experts have shown that, historically, those who follow the best picks of the best money managers can beat the S&P 500 by a superb margin (see the details here). Let’s check out the new hedge fund action encompassing New Oriental Education & Tech Group Inc. (NYSE:EDU). How have hedgies been trading New Oriental Education & Tech Group Inc. (NYSE:EDU)? Heading into the first quarter of 2019, a total of 25 of the hedge funds tracked by Insider Monkey were bullish on this stock, a change of 0% from the previous quarter. 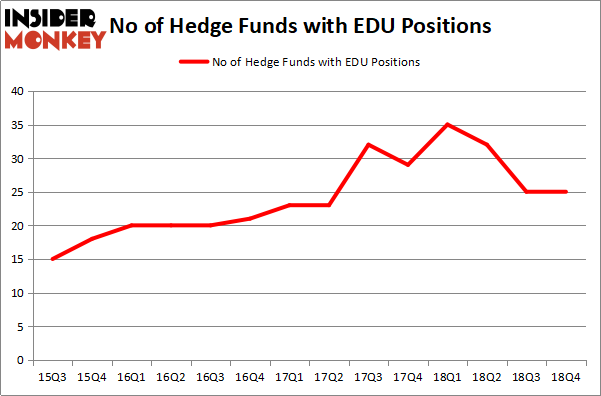 By comparison, 35 hedge funds held shares or bullish call options in EDU a year ago. So, let’s check out which hedge funds were among the top holders of the stock and which hedge funds were making big moves. Among these funds, Tiger Global Management LLC held the most valuable stake in New Oriental Education & Tech Group Inc. (NYSE:EDU), which was worth $129 million at the end of the third quarter. On the second spot was Two Sigma Advisors which amassed $89.2 million worth of shares. Moreover, Renaissance Technologies, Kylin Management, and JANA Partners were also bullish on New Oriental Education & Tech Group Inc. (NYSE:EDU), allocating a large percentage of their portfolios to this stock. Since New Oriental Education & Tech Group Inc. (NYSE:EDU) has experienced declining sentiment from the aggregate hedge fund industry, logic holds that there is a sect of money managers who were dropping their full holdings in the third quarter. Interestingly, Gabriel Plotkin’s Melvin Capital Management dropped the largest investment of the 700 funds followed by Insider Monkey, comprising close to $150.3 million in call options. Leon Shaulov’s fund, Maplelane Capital, also dumped its call options, about $48.1 million worth. These transactions are intriguing to say the least, as aggregate hedge fund interest stayed the same (this is a bearish signal in our experience). 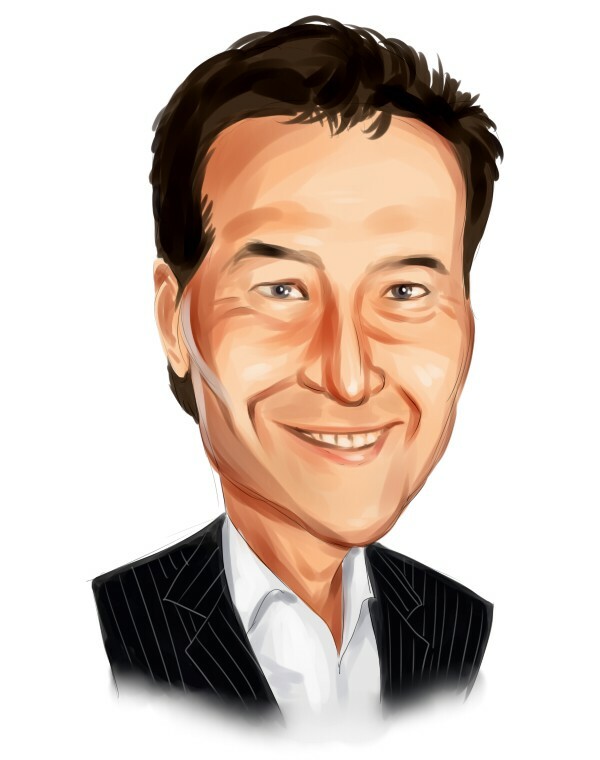 Let’s go over hedge fund activity in other stocks – not necessarily in the same industry as New Oriental Education & Tech Group Inc. (NYSE:EDU) but similarly valued. We will take a look at Wheaton Precious Metals Corp. (NYSE:WPM), Fidelity National Financial Inc (NYSE:FNF), Cenovus Energy Inc (NYSE:CVE), and Melco Resorts & Entertainment Limited (NASDAQ:MLCO). This group of stocks’ market caps are closest to EDU’s market cap. As you can see these stocks had an average of 22.5 hedge funds with bullish positions and the average amount invested in these stocks was $363 million. That figure was $621 million in EDU’s case. Fidelity National Financial Inc (NYSE:FNF) is the most popular stock in this table. On the other hand Cenovus Energy Inc (NYSE:CVE) is the least popular one with only 20 bullish hedge fund positions. New Oriental Education & Tech Group Inc. (NYSE:EDU) is not the most popular stock in this group but hedge fund interest is still above average. This is a slightly positive signal but we’d rather spend our time researching stocks that hedge funds are piling on. Our calculations showed that top 15 most popular stocks among hedge funds returned 21.3% through April 8th and outperformed the S&P 500 ETF (SPY) by more than 5 percentage points. Hedge funds were also right about betting on EDU as the stock returned 62.8% and outperformed the market as well. You can see the entire list of these shrewd hedge funds here.